Shoelover isn't very well versed in the whole "Hello Kitty" fetish subculture, other than Shoelover knows that Shoelover is not alone in the dislike of "Hello Kitty". 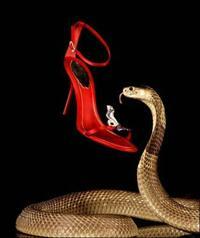 Shoelover, who usually isn't one for spewing bile, may have a new motto - "Death to the Kitty!!!" When art enthusiasts visit the Museum of Fine Arts, they often make a beeline for the Egyptian mummies or the Monet paintings. Ceramic pots from the late 6th century B.C. are easy to skip. But maybe mixing a little pop culture with history will make a difference. As part of the museum's ongoing effort to drive more visitors through all of its collections, the museum today is launching "Walk This Way," an exhibit styled like a treasure hunt that pairs eclectic shoes - from Red Sox Nike cleats to sandals worn by Marilyn Monroe - with art work in the building. The Monroe sandals are encased next to an Andy Warhol screen print of the actress. Jeweled sandals by Bernardo from the 1960s stand next to a second-century stone statue of an Indian bodhisattva, a religious figure whose braided thong sandals look familiar. Ya, but does it smell? Vermont museum showcases shoe collection. Shoelover creeps around facebook to find people from Shoelover's past. Today Shoelover found Shai Peer, a lunatic keyboard player Shoelover went to high school with at Forest Hill Collegiate, another school that tried to kick Shoelover out. P.S. 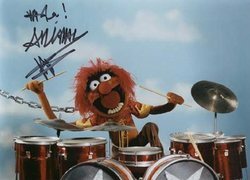 Some of you may say that Shai bears a striking resembelance to Animal from the Muppets, with one exception, Animal played the drums.